If you prefer to donate to a specific animal at Austin Zoo, our Sponsor an Animal program may be something you find rewarding. You can select the animal to which you would like to give a donation. 100% of your donation will go toward the care of the animal of your choosing. To take part in Austin Zoo’s Sponsor an Animal program, choose a program below or visit the zoo in person. It is a great way to improve the life of your favorite animals at the zoo! 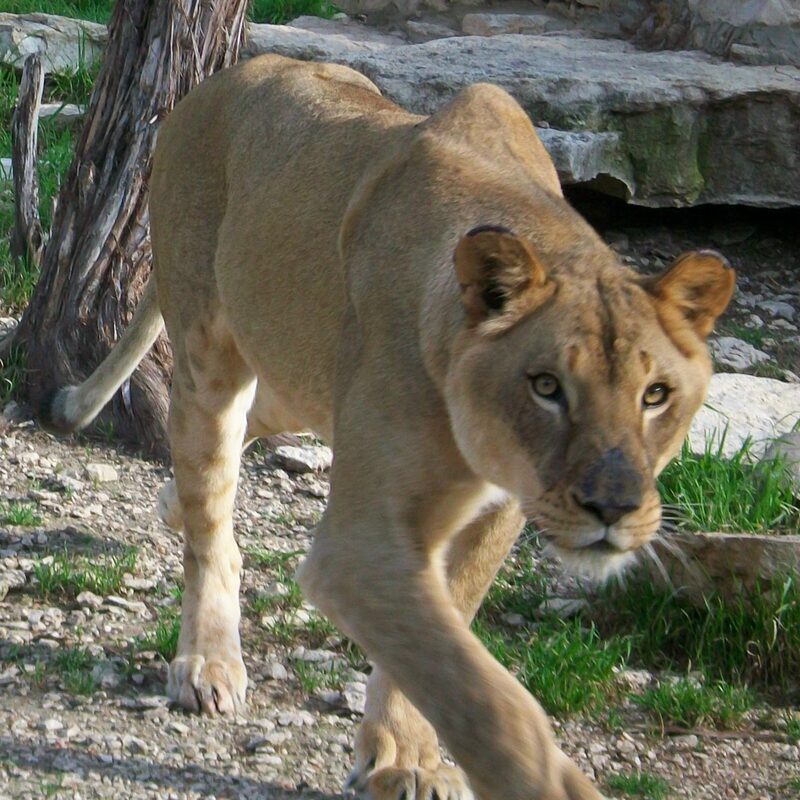 Make a contribution to help feed and care for Austin Zoo’s animals. 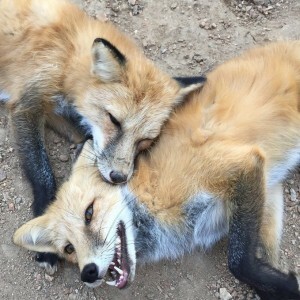 $15.00- Feeds Russian Red Foxes Mikhail & Nikolai for one week. 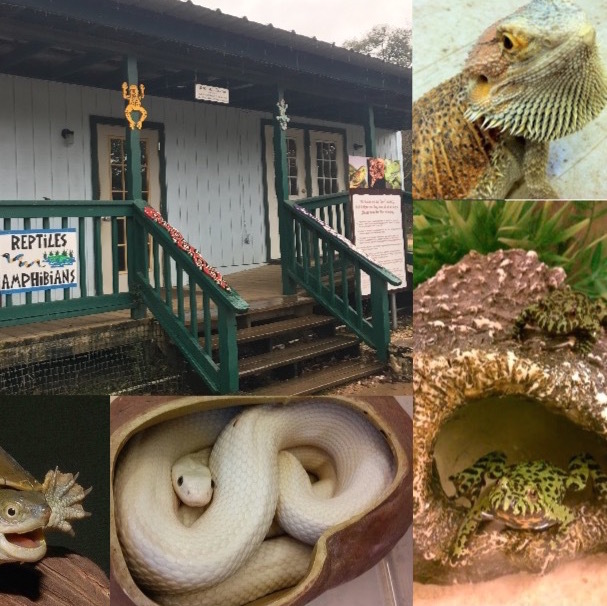 $25.00 – Feeds Austin Zoo’s reptiles and amphibians for one week. 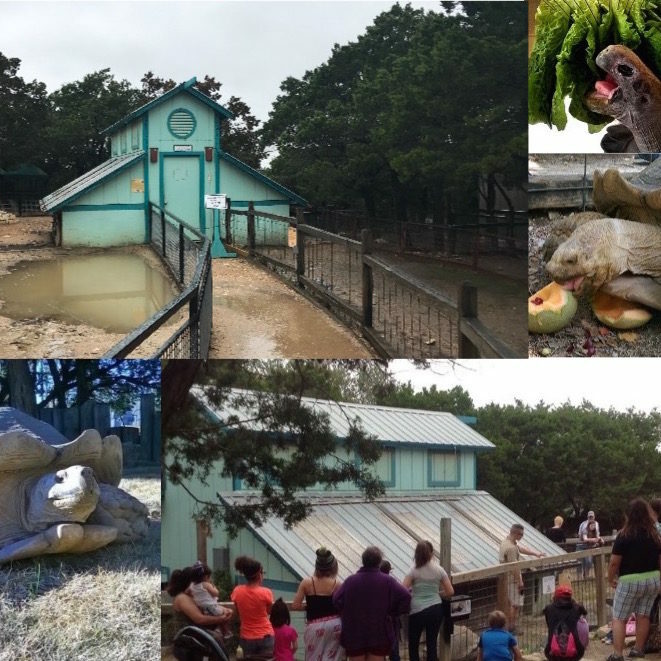 $50.00 – Feeds Austin Zoo’s tortoises for one week. 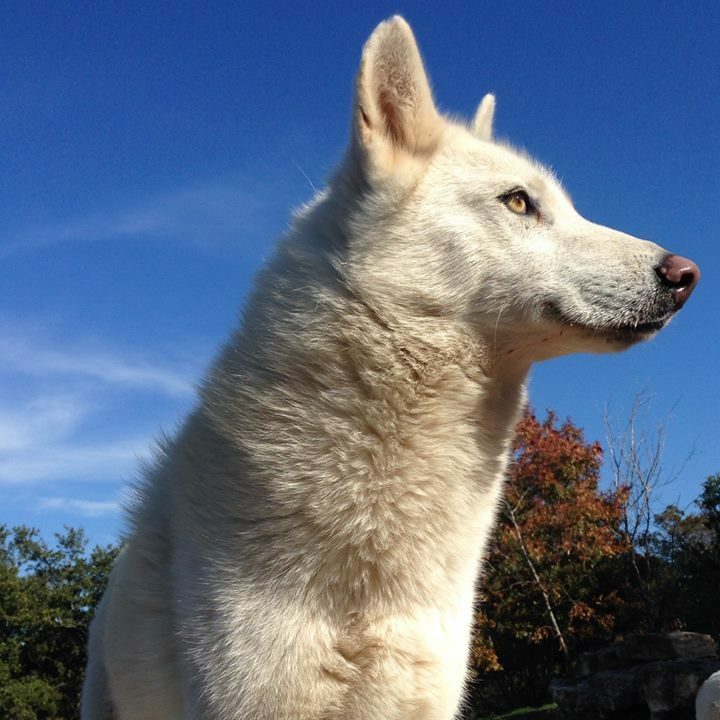 $50.00 – Feeds an Austin Zoo wolf or wolf hybrid for one week. $75.00 – Feeds Austin Zoo’s goats for one week. $100.00 – Feeds Austin Zoo’s birds for one week. $150.00 – Feeds Austin Zoo’s monkeys for one week. 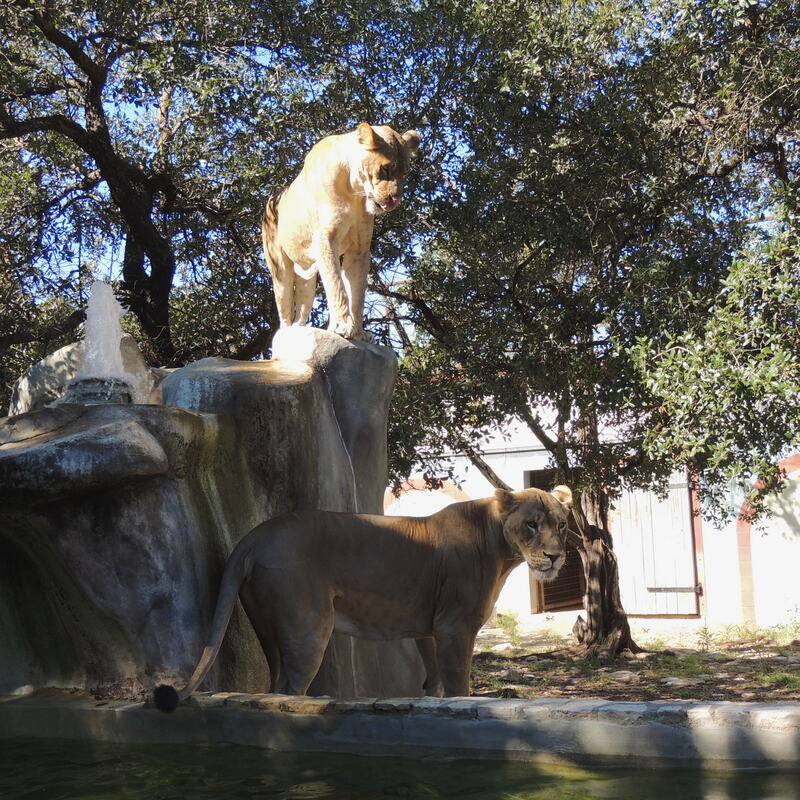 $200.00 – Feeds two big cats for one week. $250.00 – Provides an annual health exam and vaccinations for one mammal. Become an Annual Animal Sponsor today, and 100% of your donation will go to the feeding and care of the animal(s) of your choosing.In 2018, over 200,000 guests visited Austin Zoo. With your sponsorship, signage documenting your name or your company’s name will be created and displayed on the animal habitat for one year. For more information, please call 512-288-1490. 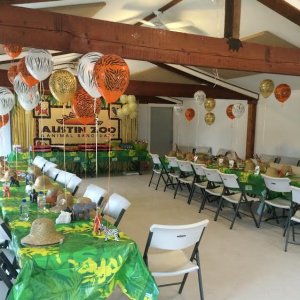 The Education Building provides an open, indoor space to host birthday parties, Animal Experience shows, and other special events like Scotty Roo and Christini puppet shows during our Boo at the Zoo Fundraiser in October and our Silent Auction during our annual Austin Zoo Revue and Grand Gala in May. 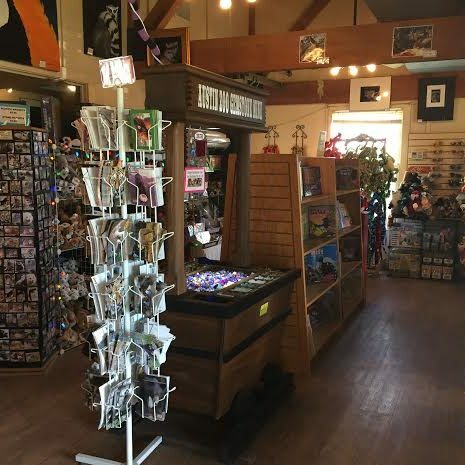 The Gift Shop houses both admissions and Austin Zoo souvenirs. Here, all of our guests must enter and exit the Zoo, buying tickets and spending time looking at the wide variety of Zoo merchandise. Our Tortoise Barn houses both the Galapagos and Sulcata Tortoises. Heaters inside keep our Tortoises warm in the winter, and fans and misters keep them cool in the summer. Guests stop by the Tortoise Barn to watch our daily Tortoise Keeper Talk, where Zookeepers feed our Tortoises, and demonstrate training and enrichment work. Our Tortoises love sweet apple treats and chilling in their mud pools. 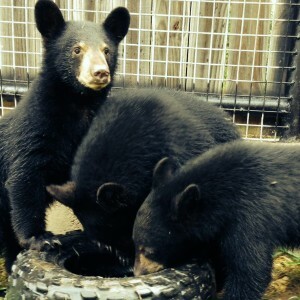 Black Bear Cubs Ruby, Tilly and Korben came to Austin Zoo from Oregon after their mother abandoned them due to a logging incident. Growing bigger every day, these three siblings love scaling up the tall fencing of their enclosure, wrestling in their swimming pool and playing with their many enrichment toys. We are currently raising funds to expand their habitat as they get older. Home to about 40 animals, the Discovery Center is the only indoor exhibit at Austin Zoo. Guests can see our snakes, turtles, tortoises, frogs, toads, lizards and cockroaches, as well as learn interesting facts and the personal stories of our many reptiles and amphibians. The Tiger enclosure currently houses Bengal Tigers Ramah, Taj and Christa. 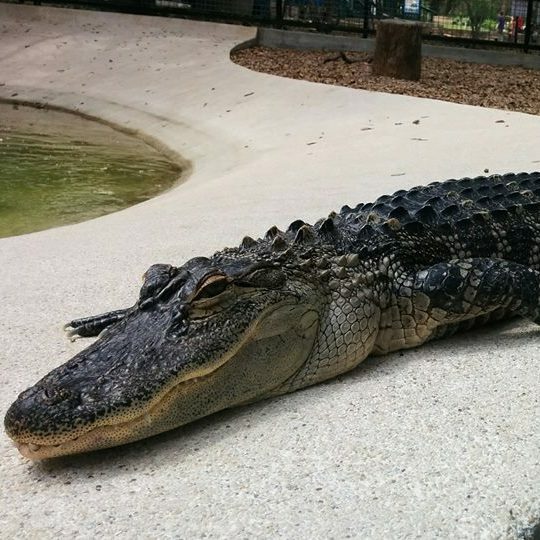 They enjoy relaxing in their large grassy enclosure or lounging in their three-tiered pool. 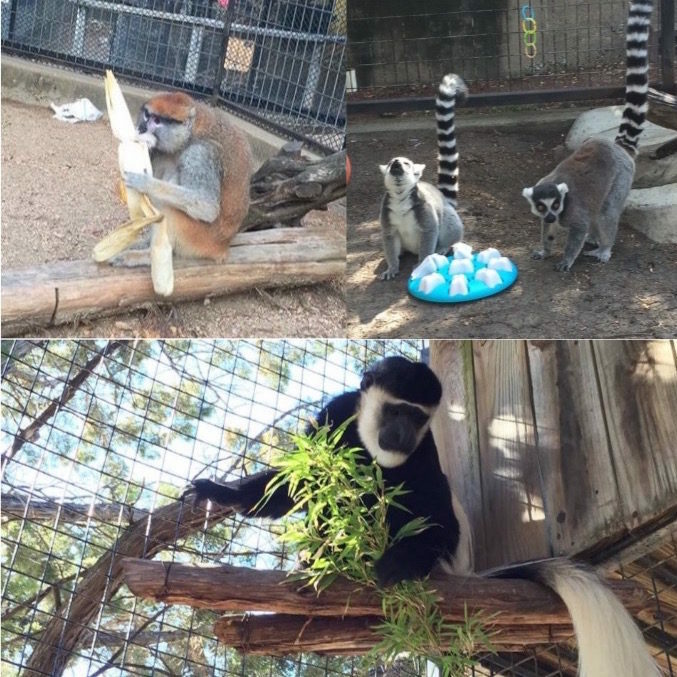 Monkey Island is home to Ringtailed Lemurs Nikki and Ringo and our largest primates, Colobus Monkeys Tico and Gonzo. These primates love foraging for toys to keep their active minds entertained. 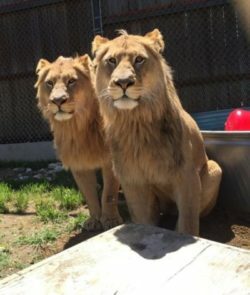 Transvaal Lions Jenali and Sango came to us in 2016 from Tucson’s Reid Park Zoo. These two brothers love their new home at Austin Zoo. They enjoy relaxing in their large grassy enclosure and ripping up cardboard toys our Zookeepers make for their playtime. African Lion Amara is one of the most popular animals here at the Zoo. She often draws a large crowd; she loves running during trainings and playing with the enrichment our Zookeepers make for her. In one of the most beautifully designed enclosures at Austin Zoo, Bobcats Festus and Marv spend their time relaxing next to their cascading fountain and pool, finding sun spots to take naps, and playing with scented enrichment items. We are excited to introduce Austin Zoo’s newest enclosure: The Ellen Proctor Habitat! 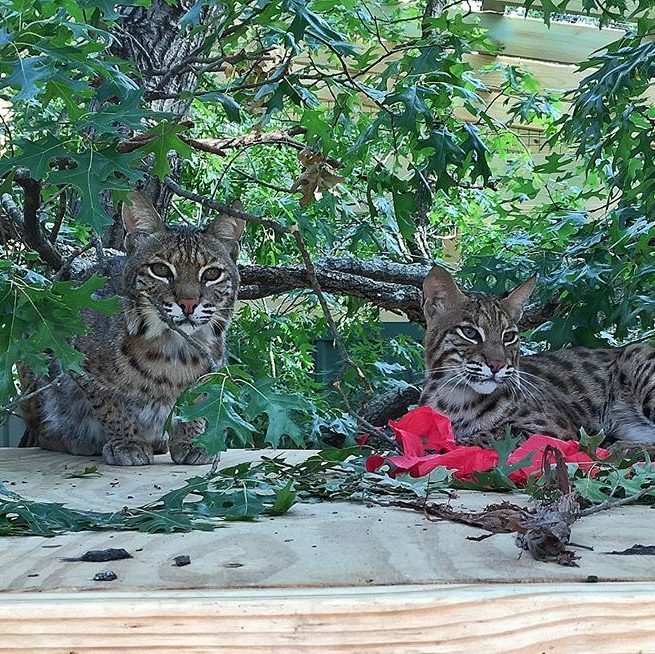 This enclosure is the new home for bobcats Charlie and Emilio. 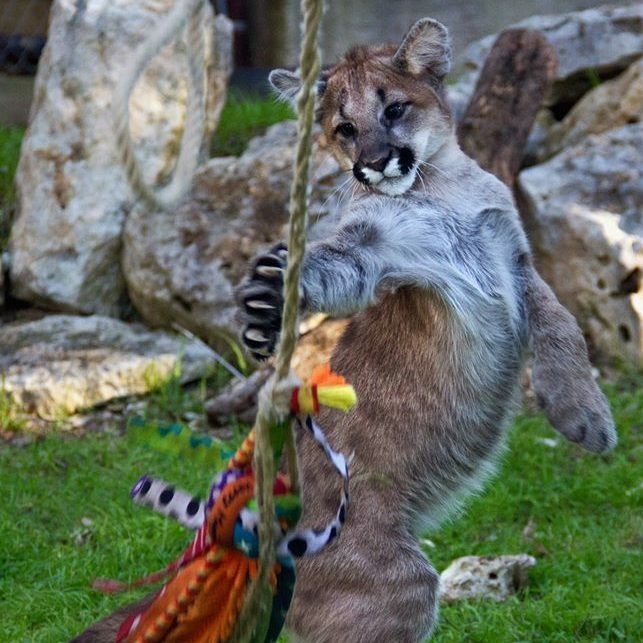 Charlie was found alone as a kitten and Emilio was surrendered to Austin Zoo from another rescue facility. 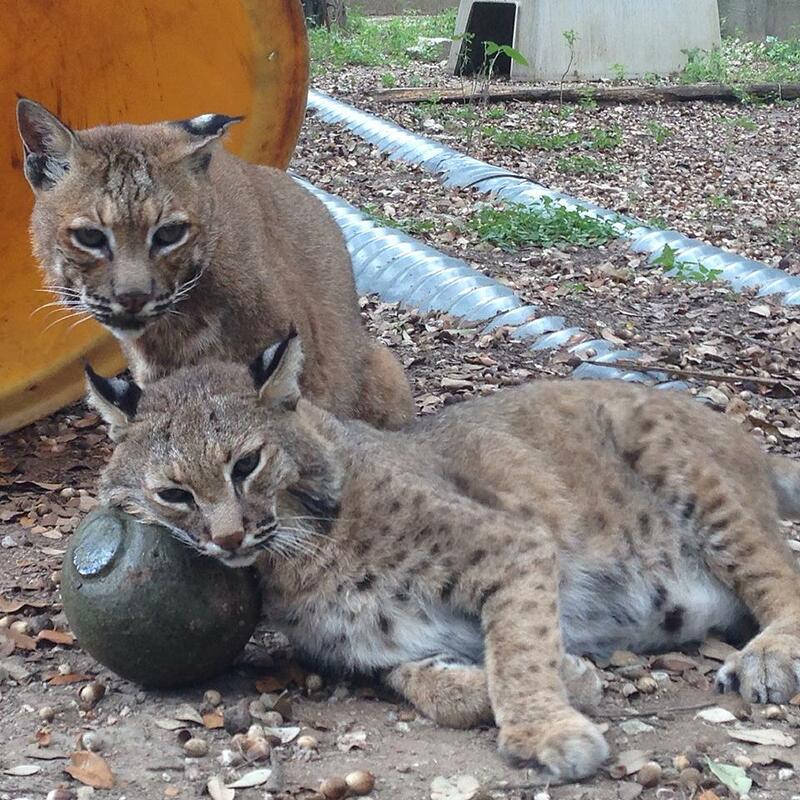 Both bobcats were deemed unfit to be returned to the wild. While they did not know each other before being introduced, Charlie and Emilio have become fast friends. Come watch them nap together under the shade of their personal Spanish Oak tree! Our four male ostriches, Jagger, Richards, Watts and Wood, came to us at the end of 2016. 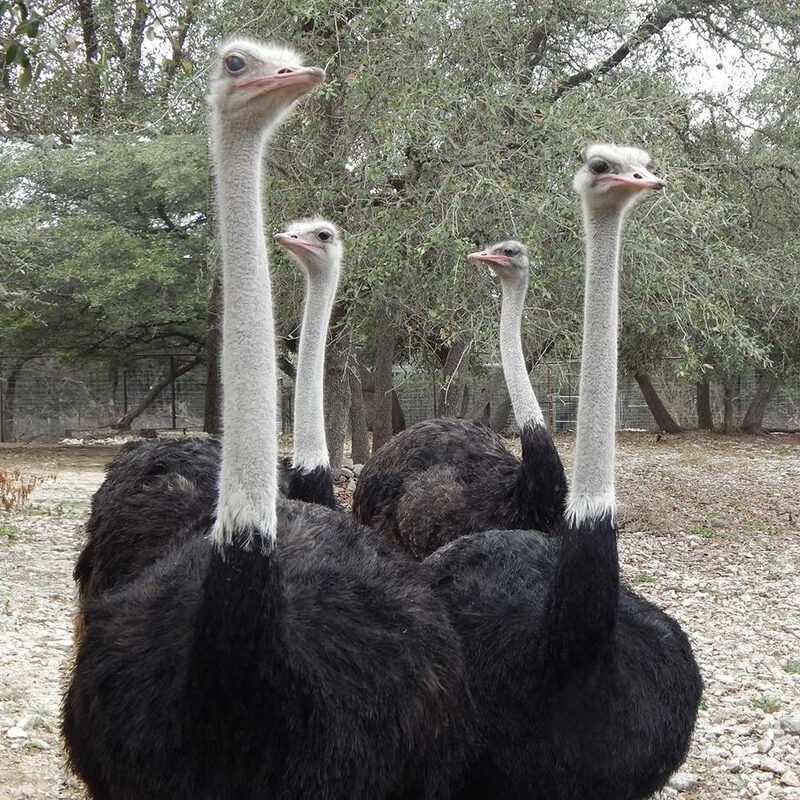 An ostrich farm with no available space surrendered them to Austin Zoo. Now happily at home in their enclosure by the petting corral, they promise to be excellent additions to the Austin Zoo family. American Alligator Rene was handed over to a Central Texas law enforcement officer, in a ferret cage, by a man who said his daughter no longer wanted him. 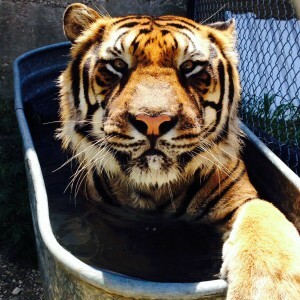 An animal control officer then brought Rene to his forever home at Austin Zoo in July of 2013. Rene spends most of his time in his pool and trains twice a week with our Zookeepers in the warm spring and summer months. Cougars Beaux and Vera both came to us separately as orphans from Washington state. 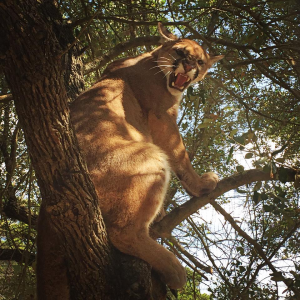 Guests often see them lounging on their wooden enrichment structure, scaling the oak tree branches in their enclosure, or playing soccer with pumpkins. Cougar Cubs Oliver, Roxy and Willow arrived at Austin Zoo at three weeks old, after their mother was killed by a hunter in Washington state. These siblings are full of energy, climbing and playing with each other in their spacious outdoor enclosure. 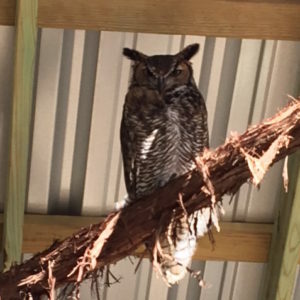 A game warden and his wife found Great Horned Owl Priscilla living on the courthouse in Eldorado, Texas. 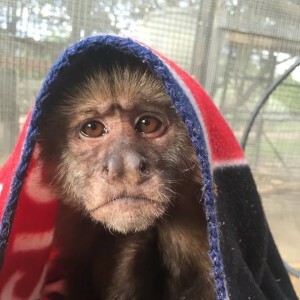 After suffering from head trauma, which resulted in loss of vision in her right eye, Priscilla was transferred to a rehabilitation facility and later released in a nearby state park. Rehabbers soon determined that hunting in the wild proved too difficult for her. Priscilla is the first owl ever rescued by Austin Zoo! Adjacent to the kinkajous, squirrel monkeys and assorted parrots, her brand new enclosure was built specifically for her special needs. The lower Wolf Hybrid yard is home to Shadow, Keanu, Kira, and Luna, who were found abandoned by their owner after Hurricane Ike in 2008. The animals were seized by animal control and quickly awarded to a receiver to be placed in a new home. They enjoy playing with each other in their pack, soaking up the sun while lazing around, and chowing down on the tasty enrichment items made for them by our Zookeepers. The Primate Palace currently houses nine capuchin monkeys and one spider monkey. This enclosure provides both comfortable, climate-controlled, indoor apartments and large, high-ceiling outdoor space to play and climb on many enrichment structures. Gray wolf sisters Juno, Denali, Aspen, Ivory and Lindy came to Austin Zoo from a facility in Illinois. These sisters love wrestling, chasing one another in their large yard space, and lounging on their wooden enrichment structures. Russian Red Foxes Mik and Nik were purchased by an individual from a website that sold foxes which were bred as pets. Upon their arrival to the US from Russia, they were confiscated by customs and brought to Austin Zoo by Texas Parks and Wildlife. They run, play and snuggle together in their spacious enclosure. The Feeding Area is home to a variety of animals, including goats, sheep, deer, llamas, pigs and geese. This area is especially popular with our young guests and Zoo members. 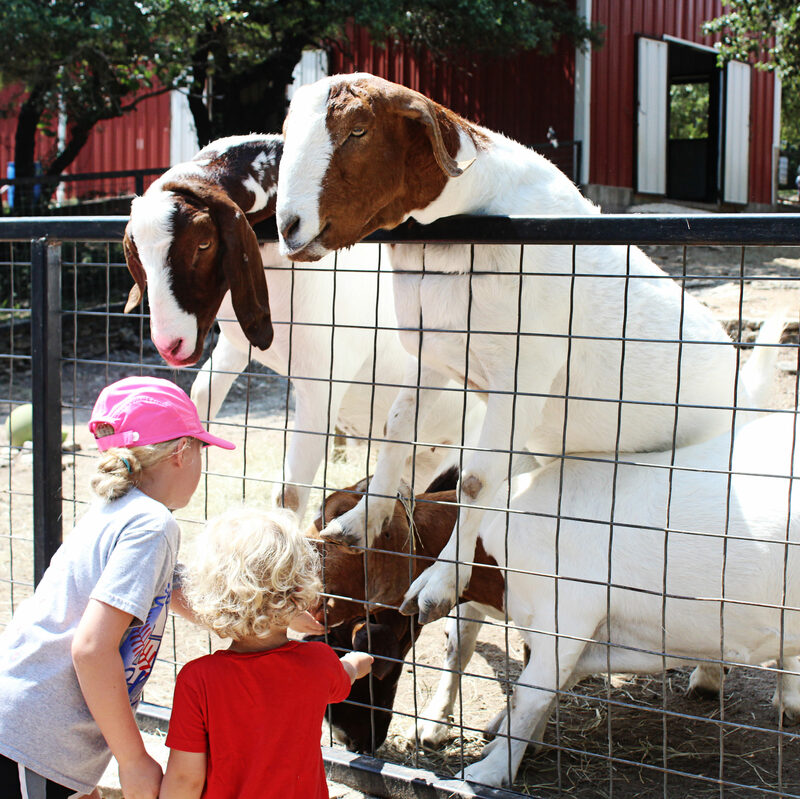 Buy a bag of hoofstock food when you arrive at Austin Zoo and create memories feeding and petting these animals! 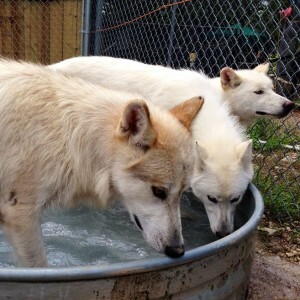 Wolf Hybrids Eli and Layla were originally owned as pets in different parts of the state. Eli’s owners abandoned him during Hurricane Ike. 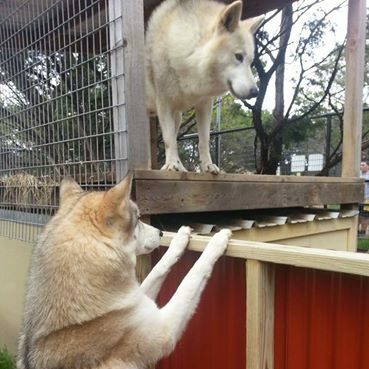 Layla was surrendered to Austin Zoo after it was determined she did not get along well with her previous owner’s other Wolf Hybrids. Now, Eli and Layla live happily together, relaxing in their two story condo and playing in their swimming pool during the hot summer months. 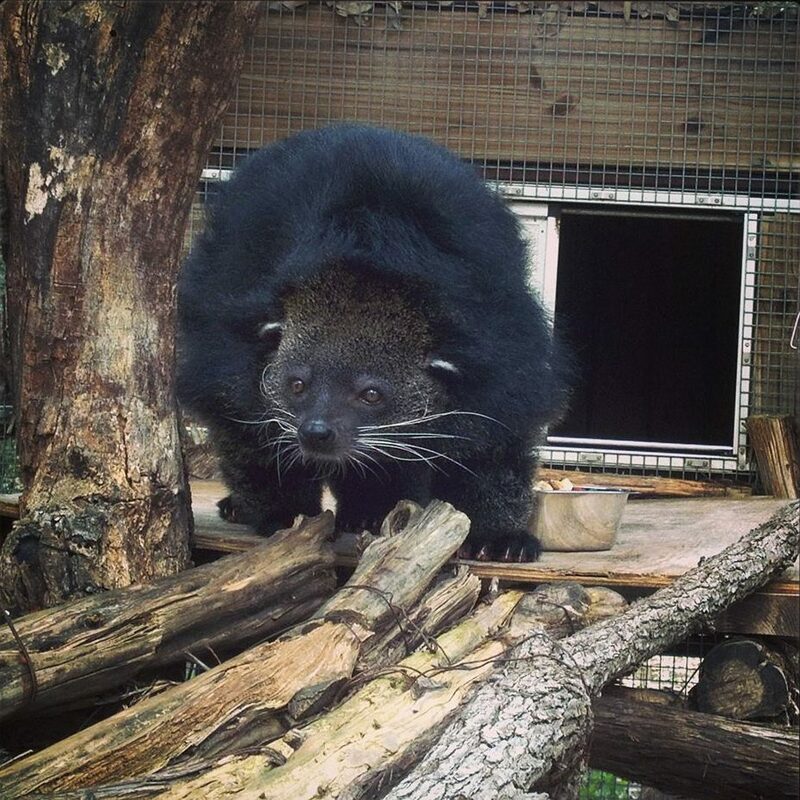 Binnie is the only Binturong currently at Austin Zoo. He was originally found on a porch by a couple in rural Pennsylvania. After being picked up by animal control, they determined he had escaped from an exotic animal trader. Completed in 2014 as an Eagle Scout project, Binnie’s playscape has several platforms to relax on, and ladders to keep him active and entertained. 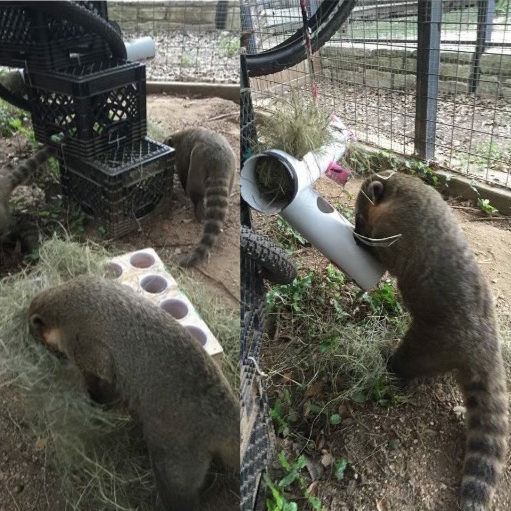 Coatis Bosley and Stitch were both previously owned as pets in two separate homes. No longer able to care for them, their owners surrendered them to Austin Zoo. Bosley and Stitch love running and hiding around the multiple levels of their enclosure – even more so when Zookeepers create enrichment items scented with essential oils.